Objective To investigate whether a low dose of the angiotensin converting enzyme (ACE) inhibitor ramipril lowers cardiovascular and renal events in patients with type 2 diabetes who have microalbuminuria or proteinuria. Design Randomised, double blind, parallel group trial comparing ramipril (1.25 mg/day) with placebo (on top of usual treatment) for cardiovascular and renal outcomes for at least three years. Setting Multicentre, primary care study conducted mostly by general practitioners in 16 European and north African countries. Participants 4912 patients with type 2 diabetes aged > 50 years who use oral antidiabetic drugs and have persistent microalbuminuria or proteinuria (urinary albumin excretion 20 mg/l in two consecutive samples), and serum creatinine ≤ 150 μmol/l. Main outcome measures The primary outcome measure was the combined incidence of cardiovascular death, non-fatal myocardial infarction, stroke, heart failure leading to hospital admission, and end stage renal failure. Results Participants were followed for 3 to 6 (median 4) years. There were 362 primary events among the 2443 participants taking ramipril (37.8 per 1000 patient years) and 377 events among the 2469 participants taking placebo (38.8 per 1000 patient years; hazard ratio 1.03 (95% confidence interval 0.89 to 1.20, P = 0.65)). None of the components of the primary outcome was reduced. Ramipril lowered systolic and diastolic blood pressures (by 2.43 and 1.06 mm Hg respectively after two years) and favoured regression from microalbuminuria (20-200 mg/l) or proteinuria (> 200mg/l) to normal level (< 20 mg/l) or microalbuminuria (P < 0.07) in 1868 participants who completed the study. Conclusions Low dose (1.25 mg) ramipril once daily has no effect on cardiovascular and renal outcomes of patients with type 2 diabetes and albuminuria, despite a slight decrease in blood pressure and urinary albumin. The cardiovascular benefits of a daily higher dose (10 mg) ramipril observed elsewhere are not found with an eightfold lower daily dose. The study protocol is described elsewhere.15 In brief, DIABHYCAR was a randomised, double blind, parallel group trial that compared the cardiovascular and renal outcomes for patients taking ramipril (1.25 mg once daily, usually in the morning) versus those taking placebo, plus their usual treatment (both groups). Eligible participants were older than 50 years, had type 2 diabetes (defined on the basis of receiving current treatment with at least one oral antidiabetic agent), and had urinary albumin excretion 20 mg/l, in two successive random urine samples. The principal exclusion criteria were a serum creatinine concentration > 150 μmol/l; treatment with insulin, an ACE inhibitor, or an angiotensin II receptor blocker; documented congestive chronic heart failure; myocardial infarction during the past three months; urinary tract infection; and previous intolerance to an ACE inhibitor. The study was conducted mostly by general practitioners in 16 countries in Europe and north Africa (Austria, Belgium, Croatia, the Czech Republic, France, Germany, Greece, Hungary, Morocco, the Netherlands, Slovenia, Spain, Switzerland, Tunisia, Turkey, and the United Kingdom). All participants provided written informed consent. Participants were randomly assigned to ramipril or its matched placebo by using a centralised telephone randomisation procedure stratified by centre and balanced by blocks of two treatments, using a computer generated random number list. For the French participants glycated haemoglobin (HbA 1c) was assayed by HPLC (Bio-Rad Diamat Analyzer, Bio-Rad, Richmond, California, USA; range of normal values 4.0-5.6%) at the biochemistry laboratory, University Hospital, Angers, France. For other participants, HbA 1c was assayed locally and adjusted to the values of the French laboratory. Serum creatinine and blood glucose concentrations were assayed locally. Urinary albumin excretion was measured in the French laboratory by nephelometry (assay sensitivity 2 mg/l, intra-assay and interassay variability 4% and 5% respectively). Patients were selected for inclusion if they had a urinary albumin excretion 20 mg/l on two consecutive occasions: this two sample strategy predicts persistently high urinary albumin excretion with a specificity of > 98%.15 16 For logistical reasons, urinary albumin excretion at end of the study was measured once only in French participants who had completed the study. At each examination, the local investigators measured blood pressure once, using a mercury sphygmomanometer and with the patient sitting. Assuming an annual incidence of the primary end point of 6.7%, we initially estimated that 4000 subjects, followed for three years, would be sufficient to allow us to detect a 20% relative risk reduction of the primary end point with a power of 90%. Owing to a lower than expected incidence of the primary end point, the steering committee decided in September 1997 to extend the follow up to up to six years and to increase the recruitment (in accordance with the recommendations of the independent data and safety committee). Efficacy was analysed according to the intention to treat approach. Cumulative survival curves were constructed by means of the Kaplan-Meier procedure, and the log rank test was used to evaluate differences between groups. Only the first event in each participant was considered as a primary end point. If further events occurred—for example, a myocardial infarction after a stroke—these were classified as secondary end points. All significance levels are two tailed. The type I error rate for testing the primary end point was set at 0.048 at the final analysis to account for the two interim analyses performed after the first 200 and 400 primary outcomes had been adjudicated. The hazard ratio of the primary end point in the ramipril versus placebo groups and its 95% confidence interval were obtained by adjustment of a Cox model to a single covariate, the allocated treatment. For other end points, relative risks and their 95% confidence intervals were calculated. We used χ2 tests for comparisons of proportions. The data are given as means (with standard deviation) or median (with 95% confidence interval) values. All statistical analyses were performed with the SAS statistical software (version 6.2). From February 1995 to April 1998, 3973 investigators in the 16 participating countries screened 25 468 people with type 2 diabetes for high urinary albumin excretion: 19 520 did not meet this inclusion criterion—a proportion similar to that seen in other studies,16 and a further 1011 did not consent to participate. The remaining 4937 people—with type 2 diabetes and high urinary albumin excretion—were randomised. Twenty investigators (who had included 25 participants) were excluded from the study by the steering committee in September 1998 because they provided no data after randomisation and refused site visits. Among the remaining 4912 participants, 2443 were assigned to receive ramipril 1.25 mg a day and 2469 to receive placebo. Table 1 shows the characteristics of participants at entry. We report data collected up to 31 March 2001. The trial ended prematurely for 838 (17%) participants: 678 (14%) withdrew and refused to be followed up subsequently (344 (14%) taking ramipril and 334 (14%) taking placebo); and 160 (3.2%) were lost to follow up (62 (2.5%) taking ramipril and 98 (4.0%) taking placebo), and their primary end point status is unknown. These participants were censored at the time of discontinuation. The median duration of follow up was 47 months (1st quarter 38 months, 3rd quarter 60 months). In all, 138 (2.8%) participants (70 (2.9%) assigned to take ramipril, 68 (2.8%) to take placebo) never started the study treatment. At one year, 2043 of the 2377 (85.9%) surviving participants in the ramipril group and 2111 of the 2415 (87.4%) surviving participants in the placebo group were still taking study drugs. At the end of the study, 1250/1209 (59.3%) surviving participants in the ramipril group and 1265/2145 (59.0%) surviving participants in the placebo group were still taking study drugs. In all, 4074 (82.9%) participants were followed to 31 March 2001, died, or presented with a non-fatal primary end point (fig 1). There were 739 primary end point events (in 15.0% of the participants) during the study, 362 (14.8%, 37.8 per 1000 patient years) in the ramipril group and 377 (15.3%, 38.8 per 1000 patient years) in the placebo group (hazard ratio 1.03, 95% confidence interval 0.89 to 1.20, P = 0.65) (fig 2). We found no difference between the two groups for each of the components of the primary end point (table 2). There were 137 primary end point events among the 1065 (12.9%) normotensive participants taking ramipril and 137 (12.3%) among the 1112 normotensive participants taking placebo (relative risk 1.044, 95% confidence interval 0.837 to 1.303). There were 225 (16.3%) primary end point events among 1378 hypertensive participants taking ramipril and 240 (17.7%) among the 1357 hypertensive participants taking placebo (0.923; 0.782 to 1.09). We found no effect of the study treatment on the secondary end points (table 2). More participants stopped taking ramipril than placebo because of coughing (3.3% v 0.9%). Two participants developed angio-oedema (one taking ramipril, related to treatment, and one taking placebo, not related to treatment). Table 3 shows the adverse events experienced by participants during the study. More participants taking placebo than ramipril took angiotensin II receptor antagonists or ACE inhibitors other than ramipril during the study (543 (22.9%) v 477 (20.0%); log rank test P = 0.05). At one year, compared with baseline values, systolic and diastolic blood pressure in those taking ramipril had fallen by 1.89 mm Hg and 1.34 mm Hg respectively, whereas in those taking placebo systolic blood pressure had risen by 0.22 mm Hg and diastolic pressure had fallen by 0.33 mm Hg (intergroup differences: systolic 2.12 (95% confidence interval 1.19 to 3.05); diastolic 1.01 (0.45 to 1.57)). At two years, compared with baseline values, systolic and diastolic blood pressure had fallen by 2.52 mm Hg and 1.89 mm Hg respectively in those taking ramipril and by 0.09 mm Hg and 0.83 mm Hg respectively in those taking placebo (intergroup differences: systolic 2.43 (1.43 to 3.44); diastolic 1.06 (0.46 to 1.65)). At final evaluation, compared with baseline values, systolic and diastolic blood pressure had fallen by 3.61 mm Hg and 2.37 mm Hg respectively in those taking ramipril and by 2.32 mm Hg and 1.98 mm Hg respectively in those taking placebo (intergroup differences: systolic 1.54 (0.34 to 2.75); diastolic 0.30 (−0.40 to 0.99)). We found no differences between the two groups for blood glucose concentration and body weight (data not shown). Between the first and the last examination, serum creatinine concentration increased comparably in the ramipril and placebo groups, by 8 μmol/l (standard deviation 37) and 9 μmol/l (SD 43) respectively. The urinary albumin excretion was measured in 1868 French participants (935 taking ramipril, 933 taking placebo) at the end of follow up. There was a trend towards more regression from proteinuria (urinary albumin excretion > 200 mg/l) and microalbuminuria (20-200 mg/l) to normal (urinary albumin excretion < 20 mg/l) or microalbuminuria among those taking ramipril than those taking placebo (27% v 23%; relative reduction in risk 14% (95% confidence intervals −4% to 28%), χ2 test, 1 df, P < 0.07). The hypothesis tested in the DIABHYCAR study was that 1.25 mg of ramipril would reduce cardiovascular risk, in parallel to a fall in urinary albumin excretion, and without any decrease in blood pressure. Results were not as expected. Blood pressure in the ramipril group decreased minimally but significantly; urinary albumin excretion improved slightly; and the cardiovascular risk was not reduced. Therefore, the DIABHYCAR study shows that a low dose of ramipril—1.25 mg a day for three years or more—does not reduce the high cardiovascular risk of patients with type 2 diabetes with high urinary albumin excretion, mostly recruited by general practitioners. By comparison with the HOPE and MICRO-HOPE studies,8–10 this absence of cardiovascular protection by low dose ramipril suggests that a marked inhibition of the renin-angiotensin system is required to reduce the cardiovascular risk associated with type 2 diabetes and raised urinary albumin excretion. The absence of cardiovascular prevention in high risk subjects by 1.25 mg ramipril once a day—whereas a 10 mg dose was effective—suggests a dose dependency of the cardioprotective effect of this ACE inhibitor. The same interpretation may apply to all other blockers of the renin-angiotensin system, which differ by their pharmacokinetics and pharmacological properties. Several of our results show that this low ramipril dose did have a biological effect, however. We detected the expected effects of an ACE inhibitor. The differences in systolic (2.43 mm Hg) and diastolic (1.06 mm Hg) blood pressure between the ramipril and placebo group are of the same magnitude as the differences in the MICRO-HOPE study (2.4 mm Hg, 1.0 mm Hg). In the MICRO-HOPE study the relative reduction in urinary albumin excretion induced by a 10 mg/day dose of ramipril was 22%9 whereas in the DIABHYCAR study the reduction was 14% for a 1.25 mg/day dose. This reduction was measured in a subgroup of French patients who survived and completed the trial, which underestimates the actual effect because of the exclusion by death of the patients with the most serious illnesses. The increased incidence of cough in the group taking ramipril also confirms—through the presence of an expected adverse effect—the biological efficacy of the 1.25 mg ramipril dose. Several factors may contribute to a dilution of the effect of low dose ramipril in comparison with placebo. To have a sufficient number of events, 16 countries and a large number of general practices participated, thereby increasing heterogeneity of both clinical care (especially the timing and routine methods of blood pressure measurements) and duration of previous exposure to risk factors (hypertension, diabetes, hypercholesterolaemia) and treatments. Retrospectively, the study had a 90% power to detect a 20% difference in the combined end point between the groups, with an α risk of 0.048. However, some usual difficulties of long term trials were more prominent in DIABHYCAR than in MICRO-HOPE. Although only 2.8% of patients were lost to follow up, 59.3% of patients taking ramipril were still taking the drug at the end of DIABHYCAR compared with 65% at the end of MICRO-HOPE. In addition, 20-23% of the participants were exposed to a blocker of the renin-angiotensin system at some time during DIABHYCAR, whereas this occurred in only 12-15% of the patients during MICRO-HOPE. We still consider, however, that the use of low dose ramipril may explain most of the striking difference between MICRO-HOPE (25% relative risk reduction of the combined primary outcome, 95% confidence interval 13% to 36%, P < 0.004) and DIABHYCAR (3%, 95% confidence intervals −11 to 20%, P = 0.65), when interpreted within the context of what is already known on the cardiovascular and renal protective effects of ACE inhibitors and angiotensin II antagonists, and more specifically of ramipril. That cardiovascular and renal protection by an ACE inhibitor is dose-dependent has important implications for current clinical care and for research on prevention of cardiovascular disease by the inhibition of the renin-angiotensin system. It means that patients treated by once daily, usual doses of ACE inhibitors in hypertension trials may have experienced a lower cardiovascular benefit than could have been safely achieved if ACE inhibitors had been used at higher doses. The benefit to risk ratio of high doses of other ACE inhibitors, of angiotensin II antagonists,23 or of the two types of drugs combined certainly deserves further investigation. Despite the well known difficulties of interpretation generated by the results of “negative” randomised trials, we conclude that our results, interpreted in the context of other experimental and clinical data, show that high doses of ramipril—and possibly other blockers of the renin-angiotensin system—are preferable to low doses in the prevention of cardiovascular and renal events in patients at high risk of cardiovascular events. Principal investigator: M Marre (Paris). National coordinators: Austria: G Schernthaner; Belgium: R Rottiers; Croatia: V Profozic; Czech Republic: J Perusicova; France: M Marre; Germany: J Mann; Greece: S Pappas; Hungary: G Pogatsa; Morocco: J Belkhadir, F Hakkou; Netherlands: J Jonker; Slovenia: G Schernthaner; Spain: F Hawkins; Switzerland: K Scheidegger; Tunisia: M Gueddiche; Turkey: N Dinccag; United Kingdom: G C Viberti. The list of the 1861 investigators who included at least one patient is available on request. Members of the steering committee: F Alhenc-Gelas, J P Boissel, F Cambien, S Etienne, A Girault-Louvel, P Gueret, M Lievre, J Mann (vice chairman), M Marre (principal investigator), J Ménard, P Passa (chairman), P F Plouin, D Vasmant, L Vaur (secretary), G C Viberti, C Weisselberg. Members of the central coordinating centre: J P Boissel, M Lievre. Writing committee: G Chatellier, M Lievre, J Mann,M Marre, J Ménard. Executive committee: J P Boissel, V Bost, M Cambien, Y Gallois, N Genes, J Gillet, M Herve, M Lievre, M Marre, L Martin, A Perret-Hantzperg, P F Plouin, L Vaur. Biological committee: F Alhenc-Gelas (chairman), F Cambien, A Girault-Louvel (vice chairman), M Lievre, M Marre, J Ménard. Central end-point committee: E Bonnefoy, G Chatellier (chairman), T Moreau, L Pinede. Independent data and safety committee: E Eschwege, C E Mogensen, N Victor, S Weber. We thank Françoise Defrance for her secretarial help and Alex Edelman for English editing. Contributors: MM, Daniel Vasmant, PhP, and JM conceived the study. Laurent Vaur and Nathalie Genes were responsible for the conduct of the study. ML did the data management. ML and GC did the statistical analysis. MM, JM, ML, GC, and JFEM wrote the manuscript, which was circulated to among all investigators. MM will act as guarantor for the paper. Funding This study was supported by a grant from Aventis (Paris) and by a Programme Hospitalier de Recherche Clinique (French health ministry) in Angers in 1996. Competing interests During the past five years MM, ML, GC, JFEM, PP, and JM have received reimbursements for attending symposiums, for speaking, or for consulting, or have received funds for research about the renin-angiotensin system, from the following companies: AstraZeneca, Aventis, Bristol-Myers-Squibb, Merck Sharpe Dohme, Servier, and Takeda. For this study MM and ML received funds from Aventis for assaying urinary albumin and data management respectively. The following investigators are or had been employees of Aventis: Sylvie Etienne, Nathalie Genes, Daniel Vasmant, Laurent Vaur, Claude Weisselberg. Ethical approval The study protocol was approved by the appropriate institutional review board or ethical committee in each country. The study was approved by INSERM (Institut National de la Santé et de la Recherche Médicale), France.
. Microalbuminuria predicts clinical proteinuria and early mortality in maturity-onset diabetes. N Engl J Med 1984; 310: 356–60.
. Microalbuminuria predicts mortality in non insulin-dependent diabetics. Diabet Med 1984; 1: 17–9.
. Microalbuminuria, blood pressure and diabetic renal disease: origin and development of ideas. Diabetologia 1999; 42: 263–85.
. Prevention of diabetic nephropathy with enalapril in normotensive diabetics with microalbuminuria. BMJ 1988; 297: 1092–5.
. Comparison of enalapril and nifedipine in treating non-insulin-dependent diabetes associated with hypertension: one year analysis. BMJ 1992; 305: 981–5.
. Long-term renoprotective effect of angiotensin-converting enzyme inhibition in non-insulin-dependent diabetes mellitus. A 7-year follow-up study. Arch Int Med 1996; 156: 286–9.
. The effect of angiotensin-converting-enzyme inhibition on diabetic nephropathy. N Engl J Med 1993; 329: 1456–62.
. 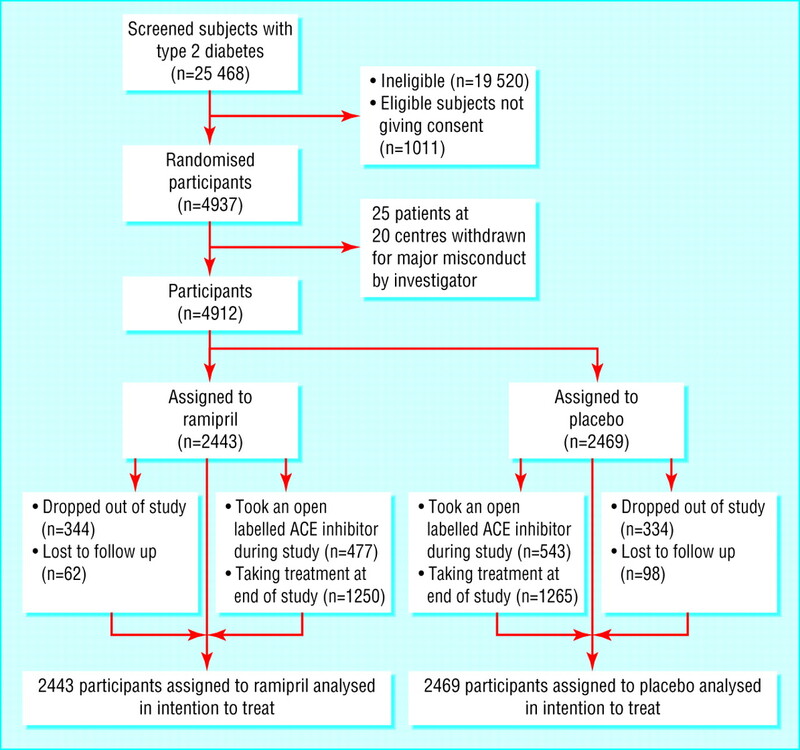 Effects of an angiotensin-converting-enzyme inhibitor, ramipril, on cardiovascular events in high-risk patients. The Heart Outcomes Prevention Evaluation Study Investigators. N Engl J Med 2000; 342: 145–53.
. Effects of ramipril on cardiovascular and microvascular outcomes in people with diabetes mellitus: results of the HOPE study and MICRO-HOPE substudy. 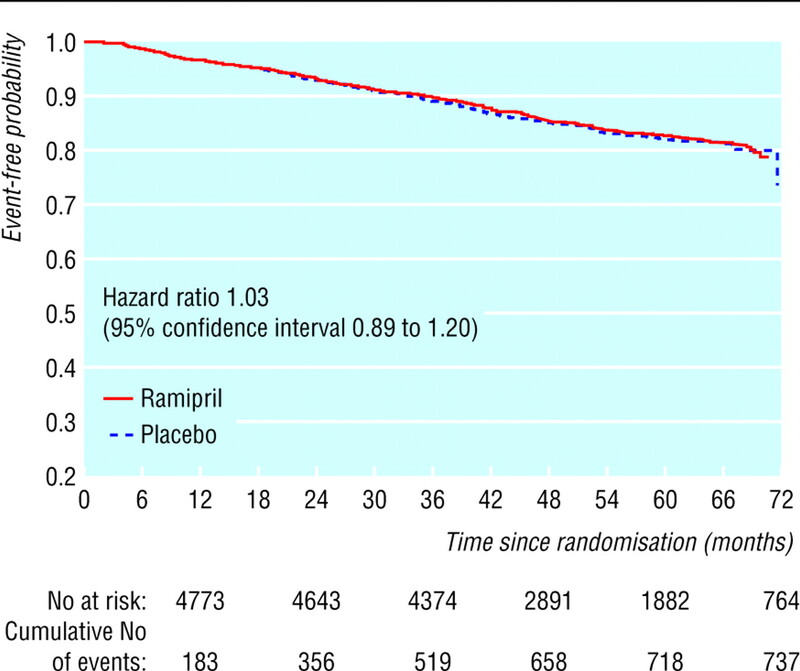 Lancet 2000; 355: 253–9.
. Use of ramipril in preventing stroke: double blind randomised trial. BMJ 2002; 324: 699–702.
. Cardiovascular protection and blood pressure reduction: a meta-analysis. Lancet 2001; 358: 1305–15.
. Blood pressure reduction and cardiovascular risk in HOPE study. Lancet 2001; 358: 2130–1.
. Small doses of ramipril to reduce microalbuminuria in diabetic patients with incipient nephropathy independently of blood pressure changes. J Cardiovasc Pharmacol 1991; 18: S165–8.
. Ramipril-induced regression of left ventricular hypertrophy in treated hypertensive individual. HYCAR Study Group. Hypertension 1995; 25: 92–7.
. The non-insulin-dependent diabetes, hypertension, microalbuminuria or proteinuria, cardiovascular events, and ramipril (DIABHYCAR) study: design, organization, and patient recruitment. DIABHYCAR Study Group. Control Clin Trials 2000; 21: 383–96.
. Determinants of elevated urinary albumin excretion in the 4937 type 2 diabetic subjects recruited for the DIABHYCAR study in Western Europe and north Africa. Diabetes Care 2000; 23(suppl 2):B40–8.
. Low-dose ramipril reduces microalbuminuria in type 1 diabetic patients without hypertension: results of a randomized controlled trial. Diabetes Care 2000; 23: 1823–9.
. Reduction of ACE activity is insufficient to decrease microalbuminuria in normotensive patient with type 1 diabetes. Diabetes Care 2001; 24: 919–24.
. Effect of low-dose ramipril on microalbuminuria in normotensive or mild hypertensive non-insulin-dependent diabetic patients. North-East Italy Microalbuminuria Study Group. Am J Hypertens 1995; 8: 876–83.
. Dissociation between the antiatherosclerotic effect of trandolapril and suppression of serum and aortic angiotensin-converting enzyme activity in the Watanabe heritable hyperlipidemic rabbit. Hypertension 1995; 25: 1306–10.
. Effects of ramipril and vitamin E on atherosclerosis: the study to evaluate carotid ultra-sound changes in patients treated with Ramipril and vitamin E. Circulation 2001; 103: 919–25.
. The effect of irbesartan on the development of diabetic nephropathy in patients with type 2 diabetes. N Engl J Med 2001; 345: 870–8.
. Comparative angiotensin II receptor blockade in healthy volunteers: the importance of dosing. Clin Pharmacol Ther 2002; 71: 68–76.